Winter and spring have been unseasonably wet for central Victoria. 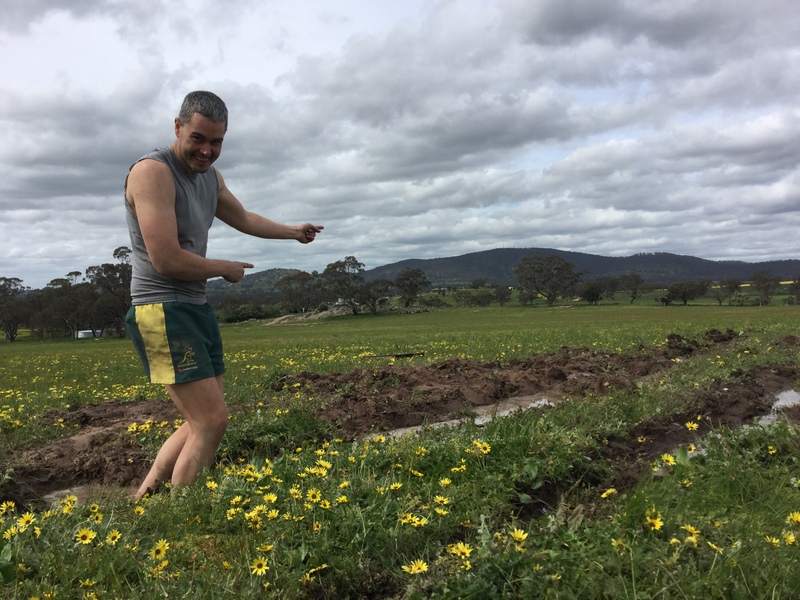 With plenty of moisture in the soil, things were looking green and gorgeous so when a friend asked me to farm-sit for him I jumped at it. Looking after horses, a moustachioed cat and a beautiful border collie were a small price to pay for enjoying a landscape of granite boulders and grape vines. That was until the dog ran away. Dusk arrived and Annie was still missing in action. 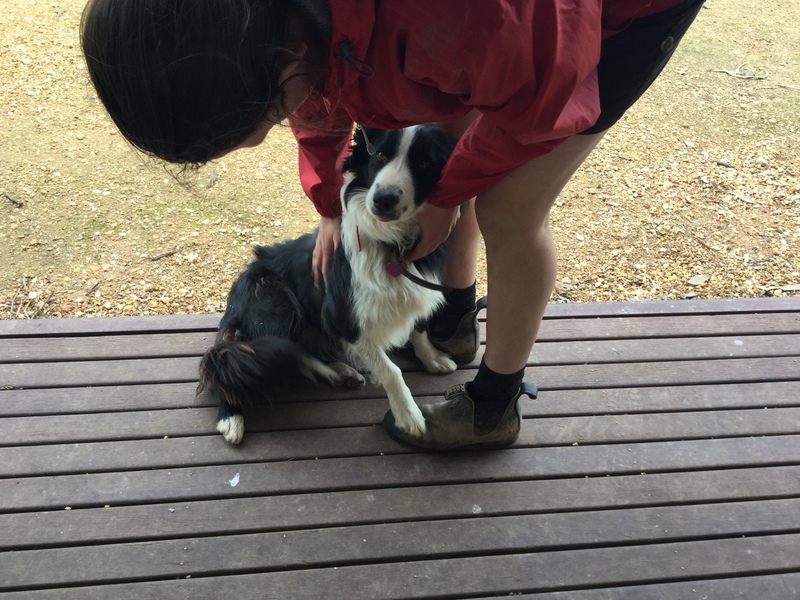 Terrified by the idea of telling my friend about his lost dog, I decided to chase her down. 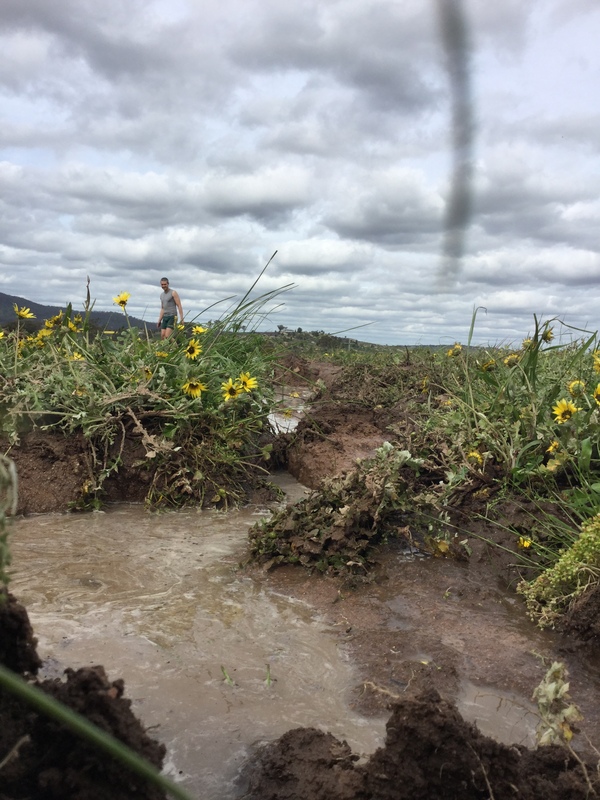 I had been warned about the risk of getting bogged if I deviated off track…. meh! The ground seemed solid, I had a decent 4wd, and I clearly knew better. Spotlights on and eyes scanning, I started cruising across the paddocks. But pride comes before the fall. 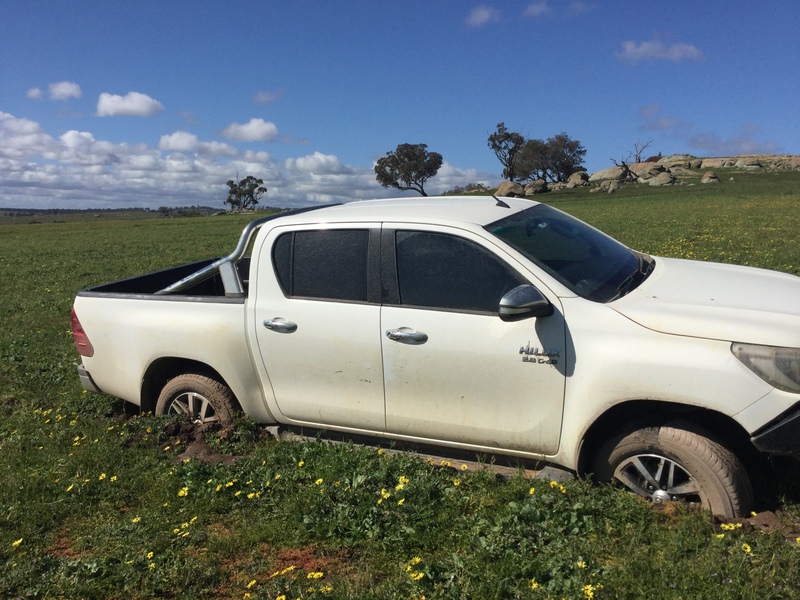 It was only when the ute suddenly stopped moving did I appreciate that the ground was less fluid-tolerant than my gestalt told me. Lost car, lost dog, lost for words (other than 4-letter ones), I tried to make meaning of the day’s events and realised it was a teachable moment in the management of sepsis in the emergency department. When patients arrive in the ED with febrile hypotension, we routinely prescribe in excess of 20-30cc/kg of salt water. The pseudoaxiom is that fluid bolus therapy will improve macrocirculation (arterial blood pressure), and therefore improve microcirculation (tissue perfusion). This is unlikely to be true. Empirically “aggressively resuscitating” people with fluid boluses probably causes harm. Like the fool in the Hilux chasing the missing dog, we chase haemodynamic targets with unproven watery therapies (or disproven if you’re a marginalised African child) that are physiologically suspect and warrant close examination. The pathophysiology of sepsis is complicated. The basic mechanisms of the disease, however, (at least as we currently understand it) are less complex: vasodilation and glycocalyx (GCX) dysfunction. Organ dysfunction in septic shock can largely be attributed to one or both of these mechanisms. It is not due to hypovolaemia. Currently there are no treatments for GCX stabilisation (unless you are a Scandinavian neonate having open heart surgery in which high doses methyl-prednisolone seems to reduce concentrations of a plasma syndecan-1; an alleged surrogate for GCX dysfunction). Current treatments for vasodilation include noradrenaline, adrenaline, vasopressin, methylene blue, and angiotensin-2. In sepsis, fluids cause organ dysfunction through worsening interstitial oedema due to GCX dysfunction, and cause vasodilation by stimulating release of naturetic peptides. It is therefore bizarre that it should be used as a first line therapy for septic shock. Pseudoaxiom one: Fill the tank before you squeeze. There is no tank to fill in sepsis, and a vasodilated state is probably best managed with vasoconstrictors. Giving a septic patient a fluid bolus will increase cardiac filling pressures, triggering release of naturetic peptides which cause vasodilation. Thus in sepsis, fluids can be considered a vasodilator therapy. If clinicians are concerned that there is inadequate preload, the LV end-diastolic volume should be measured with echo. Patients with septic shock have a depressed Starling curve with a reduction in recruitable contractility via increased preload. > 50% of patients with septic shock have diastolic dysfunction which responds poorly to fluid therapy. 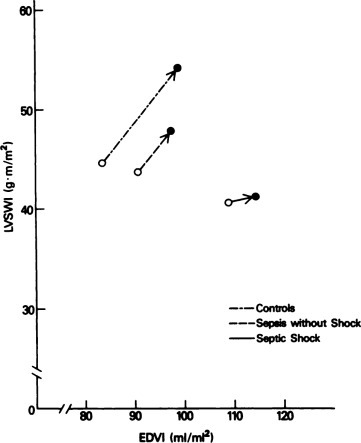 In patients with septic shock less than 5% of administered fluid remains in the intravascular space at 1hr. This fluid leaks from the vascular compartment to enter the interstitium, causing organ dysfunction. 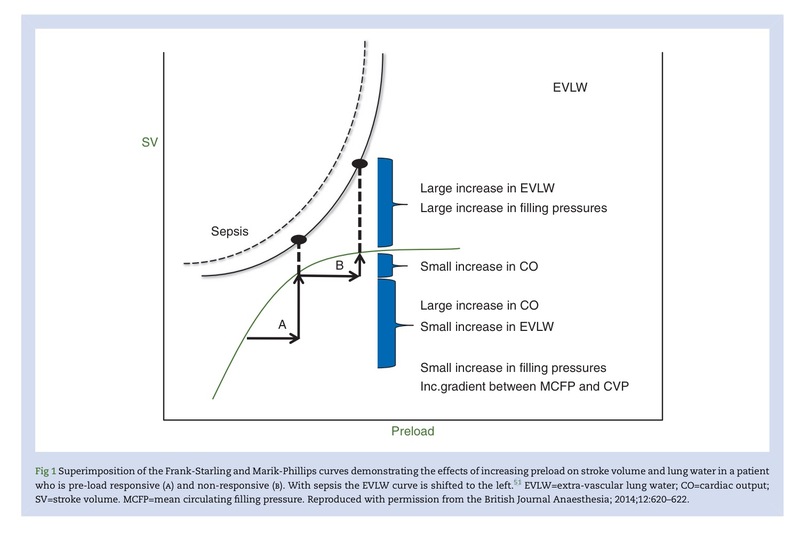 The Marik-Philips EVLW curve illustrates the respiratory harms of fluid therapy in patients with increasing filling pressures. In the abdomen, increased initerstital oedema causes intra-abdominal hypertension, gut failure and renal failure. The disrupted GCX enables translocation of albumin into the interstitium, where it continues to exert an osmotic effect causing further interstitial oedema. The concept of fluid tolerance in pursuit of haemodynamic “stability” in shocked septic patients is as ill-fated as a hunt for a lost dog across a muddy paddock in the dark. 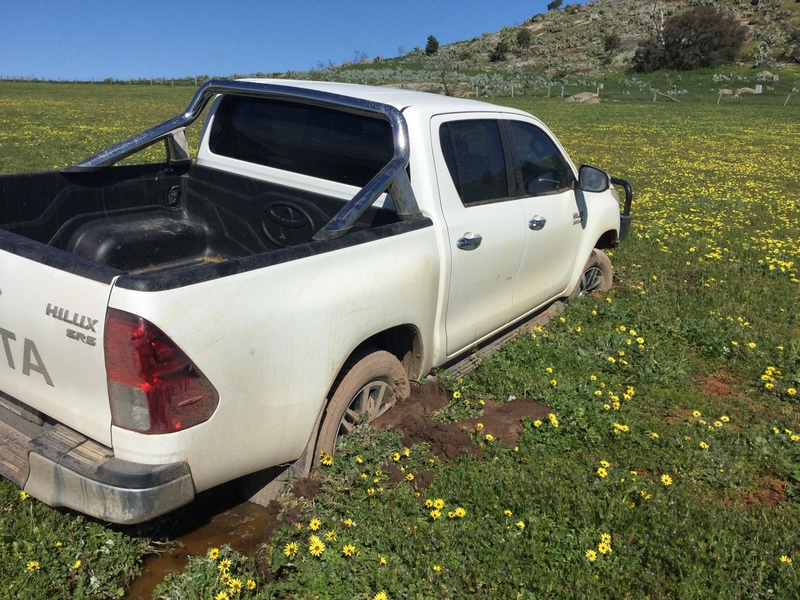 Even though there was no surface water visible, the ground swallowed up my ute before I even realised I was on a path to trouble. So too do we drive our septic emergency department patients further into multi-organ dysfunction with iatrogenic salt-water drowning. So how do I manage septic shock in the ED? After antibiotics are on board I perform a focused haemodynamic assessment using echo to examine preload (LVEDD or LVEDA), contractility (fractional shortening or fractional area change), filling pressures (interatrial septal motion), and diastolic function (E/A, E/e prime). This takes less than 5 minutes. If patients have had no recent oral intake I replace guesstimated deficits (4, 2, 1 method) then commence maintenance fluids (D5W and providing Na, K, Mg as required [N.B. Australian RDI of sodium is 40mmol, not 154mmol]). I concurrently target a MAP of 65-70mmHg using a combination of noradrenaline, vasopressin and adrenaline, depending on the haemodynamic state. So what happened to the ute you ask? Like the drowned patient needing CRRT and an inpatient bed before they break the NEAT 4-hour rule, I had to phone a critical care colleague who spent 4 hrs helping me dig the car out of the quagmire and haul it to dry ground. Annie came back on her own volition without intervention and I scored a well earned “told you so” from her master. With thanks to Paul Marik, Thomas Woodcock, Rinaldo Bellomo and John Myburgh for inspiring me to care about fluids. Special thanks to Caitlin Young for helping to dig me out of my stupidity. We’re looking forward to working with a great team in 2017 and the make up of it demonstrates the extraordinary diversity that makes up Emergency Medicine in Australia. Even the core group of people who have come straight to EM via intern and HMO years (and don’t get me wrong, that was me, falling in love with EM in term 1 of intern year and never toying with anything else) bring a great mix to the team. We have people from tiny rural Australian towns, and big cities, coming from the UK, Asia and Africa and via Canada, writing for the Victorian Institute of Forensic Medicine in their “spare time”, building a craft distillery, and lord knows what else I am yet to discover. One of our advanced trainees next year is currently in the Pacific, doing a term in developing world EM while one of our new provisional trainees is in Liverpool England, doing a Diploma of Public Health; see her blog post here, describing her vision for a career combining EM and world health. We’ve also got 4 new full-time consultants starting with us next year, all of them current or previous trainees. They include one of my first ever registrars, one of the first of our international graduate HMOs to be seduced into EM training, and two of our first advanced trainee recruits. I can’t tell you proud I am, of these four people, of the contribution our team was able to make to their development and of the distance that Bendigo ED has come, from a place where we didn’t even have a FACEM on every day and where there were frequently no ACEM trainees on the roster, to a place that has been able to train and retain 4 really high quality emergency physicians who would be a credit to any department anywhere in the world. Thanks everyone for coming on board for 2017, a new hospital and more fantastic Emergency medicine training. What’s the age cut-off for stupid males (or females) to no longer be allowed to climb ladders? As long as it’s under 35 years old I’m safe. But that’s not the reason for today’s post. Yesterday I saw half a dozen patients with various painful conditions who at some stage had been prescribed opioids as first line therapy without simple analgesic adjuncts. A quick straw poll of the staff on shift at that time revealed that no-one apart from myself had heard of the WHO pain ladder. Today is a beautiful spring day in central Victoria. With crisp air, warm sun, and bees happily gathering digitalis-laden pollen from my foxgloves, it was a good opportunity to get on the roof and clean out the gutters of the house. Until my ladder broke…. 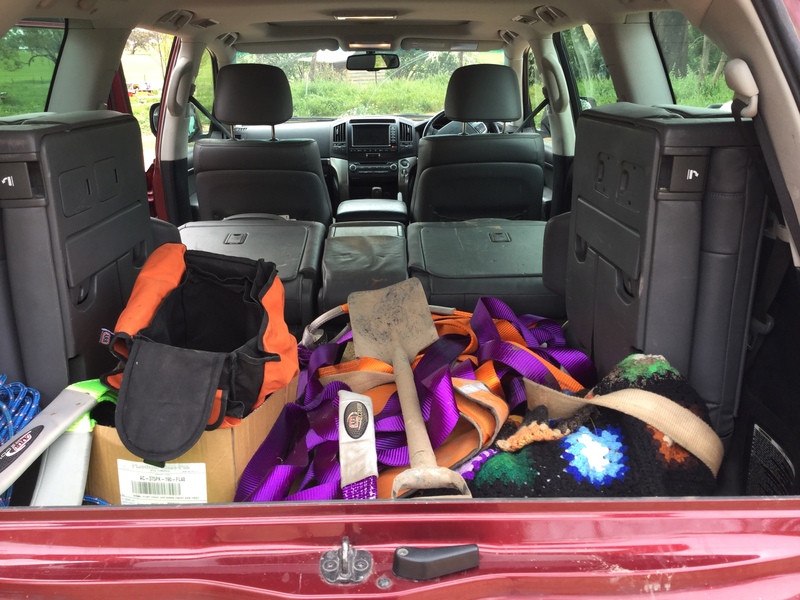 Was it a teachable moment for my personal safety? No. But it seemed like a teachable moment for how I approach analgesia in the ED. Climb the ladder to escape pain. I read this post when it was first published last year. A great synthesis indeed. I then forgot about it. Today I finished my first shift as a rat doctor (rapid assessment and treatment/triage/whatever) and followed up the day with an evening of studying crit care echo. For some reason I felt a nagging tension between these two functions, both of which are arguably core emergency physician skill sets. I was worried I would find it difficult to be good at everything under the EM roof. I wanted answers and ended up back at Mark’s blog post, but have frustratingly (and amusingly) found more questions. Since signing up to ACEM as a trainee I’ve been an ultrasound enthusiast. But after some embarrassing over-calls (and probably a host of undercalls I’m oblivious of), with varying degrees of consequence, I decided to put my money where my mouth was and pay for an expensive university qualification in clinical ultrasound. As a result, I’ve aged prematurely… within a very short space of time I turned into the old curmudgeon grumbling about young enthusiasts who pick up the probe because they know where the “ON” button. Critical care ultrasound seems to be an invaluable tool for providing patients with the best care during their moments of physiologic crisis. Unfortunately it’s not necessarily as simple as eFAST, EGLS or HI-MAP. Sure, for most of our “sick” patients it will be adequate, but if we really want to walk the walk of a critical care clinician we should probably develop more robust resuscitation strategies than giving 2L of CSL, intubating and starting a noradrenaline infusion +/- antibiotics. To develop that kind of skill set whilst wielding a sector probe, it would take time, practice, and departmental structures that foster accountability and quality control/improvement. That being the case, how does the RAT doctor get time to practice diagnosing the viral myocarditis with fever? Or the short stay/fast track doctor practice their carotid VTIs after a passive leg raise? Should we trust the ultrasound guru who can get a good A4C view in the 200kg ventilated patient to always recognise the posterior fossa stroke in a patient with vertigo? I am not convinced these dilemmas are simply a matter of more education or a broader training curriculum. For me, as soon as I begin to become better at a particular skill, my ability in other advanced skills invariably starts to attenuate. So what kind of an EP should we try to train? And again, what model of emergency care do we want? I agree with Mark – there just isn’t enough emergency critical care work to go around for everyone. Is there enough for EPs to keep their skills up? Is the critical care we provide “good enough” for the people who do roll through the door in compromised states, or should we leave it to the intensivists? Today, another installment of Director’s corner, from Diana Badcock, soon to be appearing at a major conference near you (if you live in Dublin). When healthcare professionals are asked to consider the culture of health many offer that they are trying to “Make a Difference” by providing a lifetime of “Service” for the greater good of humanity and rate themselves as being trustworthy, acting with integrity, working in teams, committed to and passionate about the cause. In reality surveys performed by health services in many hospitals in the developed world have us sitting with “BLAME” as our culture. A very immature and unsatisfactory state of affairs. 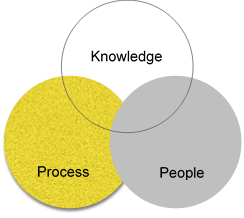 Blame stems from holding an individual responsible for a negative outcome rather than the system and processes that support the group/team where the event occurred. Gratitude ( thank you ) and apology ( sorry ) is rarely uttered in cultures consumed with blame as they are driven by people who look after “number one”. Its rare for people to acknowledge responsibility or regret. If you live in a world of blame these words destroy self-worth and credibility. Every system is perfectly designed to get the results it gets. Lets fight this system- Buck a trend. The ability to utter these two words with care and kindness can move mountains. It is hard for any one of us to change the system but we can change ourselves. Consider sharing and voicing ‘facts” that concern you, without judgement, opinion, exaggeration and emotion. Do not use tools such as “recruitment’ where you share your story with all these accouterments to create a team of us against them. This splits teams into factions and damages everyone. What doesn’t kill you will make you stronger. Thankyou…………. Check out EDCentral education page for loads of ACEM Primary exam prep material, ACEM Fellowship exam prep material, links to important papers in EM and FOAM links that I like. Much of the material is curated from elsewhere including from the ACEM DEMT network. We owe particular thanks to Brendan Whiting (almost FACEM) for generating a large number of very high quality OSCES. All his start with the letters BW. Look out for them. If there is stuff on here that you generated and did not want publicly shared in this way please do let me know. I have endeavoured to ensure that anything there was shared originally with the intention of making it widely available but the material is growing so fast it is hard to keep track of everything. For this blog post I am thrilled to introduce a new EDCentral author, the Director of the Bendigo ED, Associate Professor Diana Badcock. I am hoping this will be a regular thing and that I might even get her trained up in wordpress use herself but for the time being I am posting it on her behalf. ‘Timing and Choices’ was an expression a good friend’s father would hail along with “When the gorse is in bloom, its time for love’. 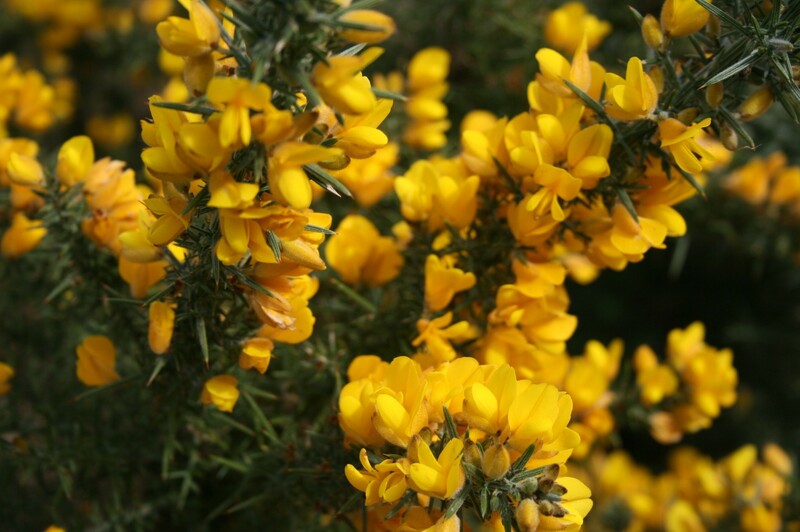 Given gorse is in flower 365 days of the year in Scotland he was clearly a romantic, but “timing and choices”? Was this a life lesson relating to success? In the Emergency Department time is of the essence in so much of what we do. The “Golden Hour” of trauma, “time to antibiotics” , “door to balloon” time, plus our hospital KPI’s (Key Performance Indicators) and NEAT (National Emergency Access) Targets are ways of measuring the success of us all, as clinicians and of the processes we work with. We drive, and teach emergency trainees to be a ‘reflex arc”. To recognise a pattern of disease and act accordingly. How does this then affect our behaviour in other areas? And can it do harm? In relationships, at home and at work, so often we would be far better to “slow down, to speed up”. If we could hold our thoughts, tongues and behaviours at times of great activity, stress and anxiety (ours and our colleagues), discussion and debate in the Emergency Room could be less disruptive. This is beneficial in delivering safe and quality patient care, and also improving staff satisfaction at work. Education in health traditionally focuses on improving scientific knowledge. intelligence has been surpassed with the more intelligent of us connecting emotionally, and with curiosity. To survive in health (or maybe for healthcare, as we know it, to survive), we must be curious and educate ourselves more widely. There is a need to understand politics, governance, the business of health, our college, the training system, the constraints of our systems and prior learnings from elsewhere and other industries. It is paramount to stay connected to everyone you meet, personally or professionally, and when at all possible for them to recall you favourably. The receptionist for the job interview will open doors in more ways than one. Treat everyone equally, acknowledge them and give them time. It will be these relationships you forge that create a network of choices later. As Director of a busy emergency department most issues I deal with relate to dissatisfaction with human factors and system processes. Rarely are complaints around lack of knowledge. Clinicians need to drive maximising value in health and become pro-active thinkers who dissect and analyse the system. We need to be then prepared to assist in re-engineering and rebuilding a sustainable healthcare system. Choices everywhere. We need to get savvy with the ‘fluffy bunny’ side of leadership and start with caring for ourselves and each other.